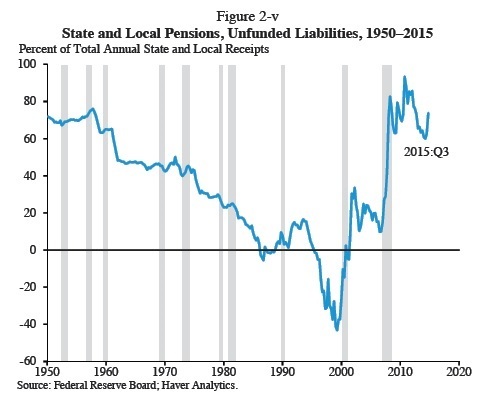 Here's a figure showing the pattern of unfunded liabilities since 1950. Notice that through the 1950s, 1960s and 1970s, the unfunded liabilities were gradually reduced. The underlying causes were a combination of good returns on pension fund assets, along with avoiding an overpromising of benefits. Notice that by the mid-1980s, unfunded liabilities were essentially zero; indeed, by the late 1990s the unfunded liabilities were negative, which means that state and local pension funds had more funds on hand than they needed. The excellent position of state and local pension funds in the late 1990s was in some ways misleading, since it was based on the dot-com stock market boom that turned south around the year 2000. 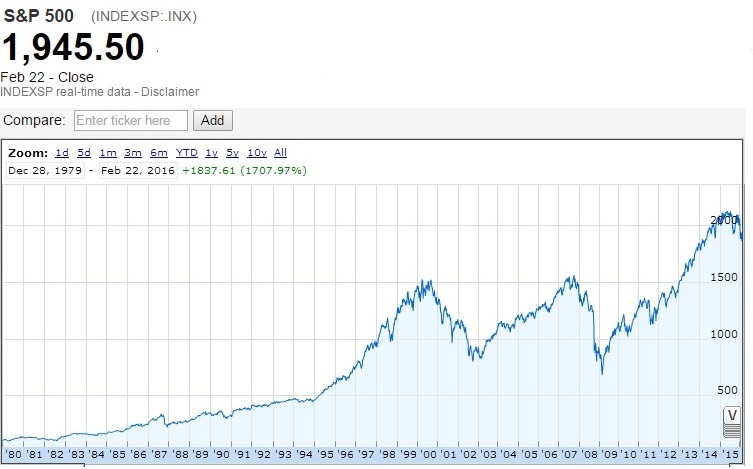 But if one looks back over the last 30 years, stock markets overall show a dramatic rise. The S&P 500 index, for example, rose from about 250 in 1986 to roughly 2,000 over a 30-year period. That's a nominal rise of about 7% per year, and adding the returns to shareholders from dividends paid out by firms would make the total return over this time a few percentage points higher. There's certainly no guarantee that stock markets in next 30 years will perform as well as they have over the last 30. In short, the reason why the unfunded liabilities of state and local pension funds are so much higher in 2016 than 30 years ago isn't because the overall stock market performed poorly. Instead, it's a grim story of mistiming the moves in the market (rather than just being steadily invested throughout), trying out alternative investments that didn't pan out, not putting enough money aside in the first place, and overpromising what benefits could be paid. I have a lot of sympathy for the retirees and soon-to-be retirees who were depending on a pension from a state or local government, and are now finding that the money isn't there to pay for the promises. But when blame gets assessed for this grim situation, it's worth remembering that those who have been making the decisions about state and local pensions had a very favorable situation 30 years ago--that is, unfunded liabilities near zero, with a period of strong stock market growth over the next three decades coming up--and they messed it up.